Seems like all the manufacturers are making Dual Sport (Dual Purpose) bikes these days. From 500cc to 1200cc there�s choice a plenty and a price to suit just about everyone. Why? Have they just figured out that you can go more places than you could before? Are Australian motorcyclists more adventurous than they used to be? For whatever reason, if we say that we can�t get a Dual Purpose bike to suit us, then we just aren�t trying. 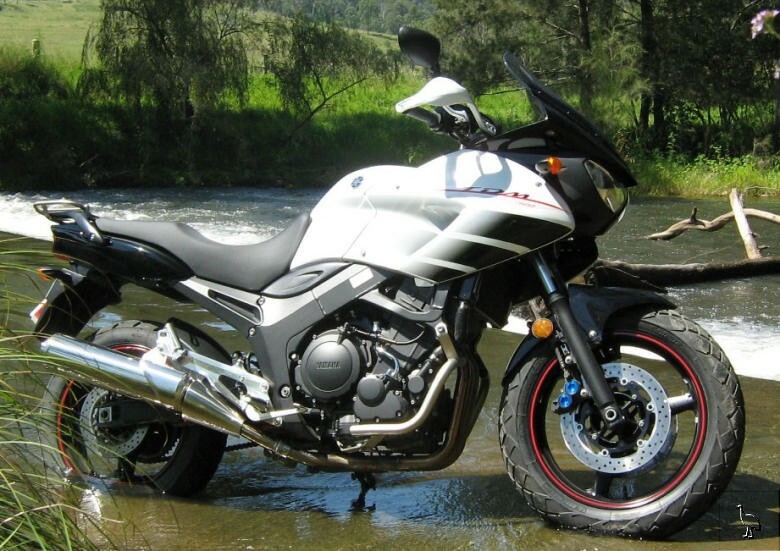 On paper the Yamaha TDM900 is very similar in specs to the Suzuki V-Strom, except for the Yam�s oh so brilliant six speed gearbox. The moderate engine performance benefits so much from the ability to choose just the right ratio for the conditions, and makes the thing very pleasant to ride. The TDM likes it�s revs over 2500rpm which means fifth gear for around town to be comfortable. At 110kph the engine is ticking over at 4000rpm. While I was in no way riding for economy during the test, 22 kilometres to the litre is excellent and a spit in the eye to the oil companies. Mirrors are very good with little vibration noticeable, headlights are good, horn is adequate, dials/displays and idiot lights easy to read. 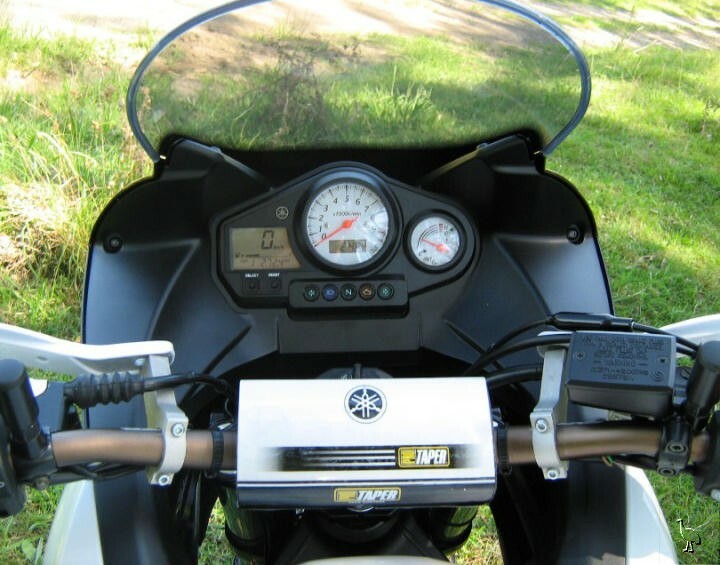 The seat is comfortable for both rider and pillion (good grab rails), you get handy tie down hook/rings to go with a sturdy rack plus the screen (3 choices) diverts air up to about nose height. I always like to find a side stand engine cut-out, this stand being easy to deploy, but, with the only centre stand being optional, adjusting and cleaning the chain will be a pain without the extra money spent. The steering is light but appears to lack lock, which may cause difficulty doing U-turns on narrow roads. I don�t know how effective 3 spoke alloy wheels will be on rough roads/tracks (Yamaha not the only ones using them), but then it isn�t a serious off-roader anyway. Short people (hello Christine Langley) will find the TDM quite a reach to the ground with my test VCP (Vertically Challenged Person) not being able to get tippy toes to the soil. 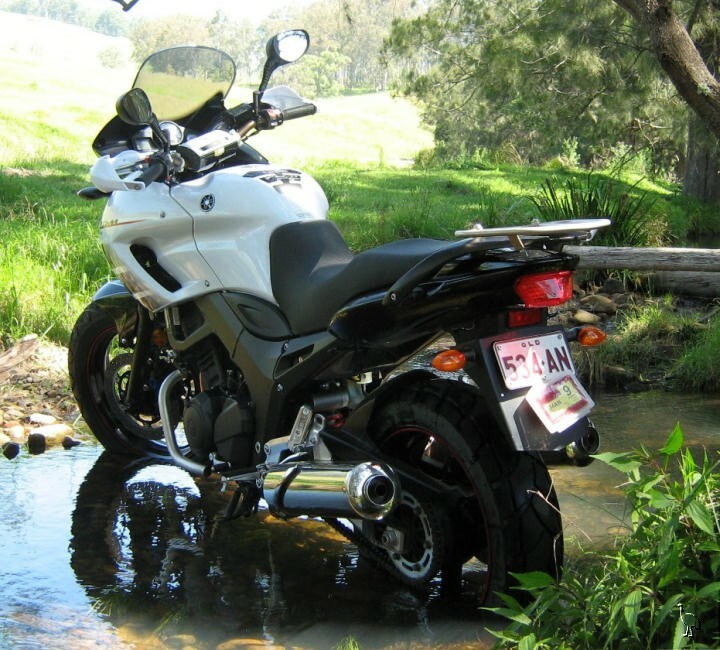 Things I didn�t like are � Too quiet, had to keep checking the tacho to change gear - Front and rear (hugger) guards won�t like muddy roads, only 12mm clearance (by contrast my GoldWing has 25mm of clearance and it hates dirt roads!) - and of all things, the GYTR handle-bars optioned on the test bike forced me to lean on my wrists and shoulders, which ain�t a good thing if you�ve got the early stages of arthritis happening. The best bet would be to have the higher standard bars or go for an aftermarket style that are high and narrow which will help cure the light steering as well as being comfortable on long rides. The TDM900 will do a good turn of top speed and any overtaking is a breeze. The tyres offered admirable grip in both wet and dry conditions plus braking is excellent. The bike has been around in 850cc-900cc forms since the early 1990�s, so if you can�t stretch it for a new one (hard to believe), then a good second hand model will suffice. I haven�t heard of any major issues with them and they seem to be very reliable. Major servicing (valve clearances etc.) happens every 40,000ks only so running costs should be fairly low. Best of all, the standard TDM900 retails at $12,999, which gets you to a lot of places both bitumen and dirt at a very economical price indeed.